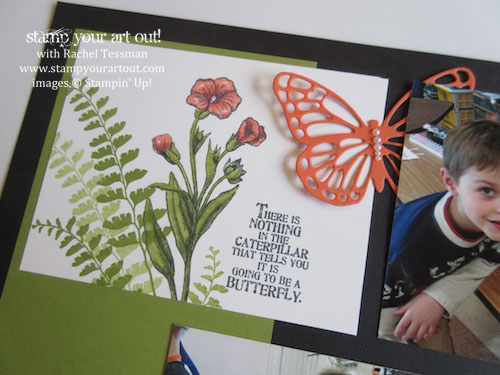 We are hopping with a special guest - The talented Rachel Tessman from Stamp Your Art Out. I ended up being inspired by a scrapbook layout of Rachel's which I have turned in to a card. To checkout Rachel's scrapbook page in more detail click here. 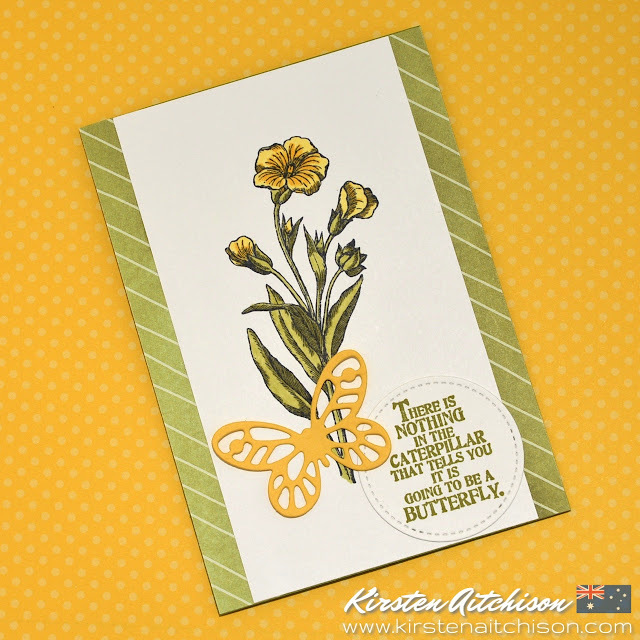 The flower image and sentiment come from the Butterfly Basics stamp set (which is retiring at the end of May 2018). I stamped the flower image using Memento ink and coloured it using my Old Olive & Daffodil Delight Stampin' Blends. To add some sparkle, I have applied a little Wink of Stella to the centre of the main flower. My sentiment is stamped in Old Olive ink and cut out using one of the circles from the Stitched Shapes framelits. 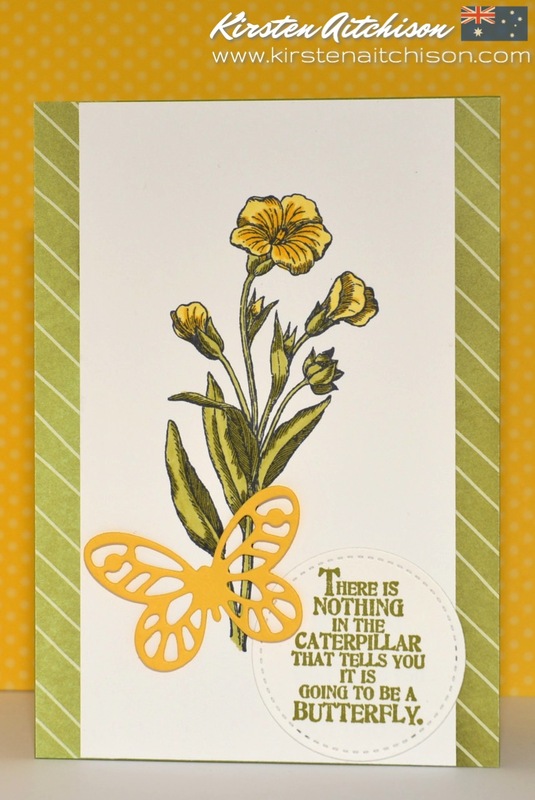 The Daffodil Delight die cut butterfly comes from the Bold Butterfly framelit set (which too will be retiring at the end of May). To add a little something to the card, I have used the Old Olive diagonal stripes sheet from the Delightful Daisy Designers Series Paper pack underneath my Whisper White card front. To tie in with the Old Olive used, my card base is also Old Olive. 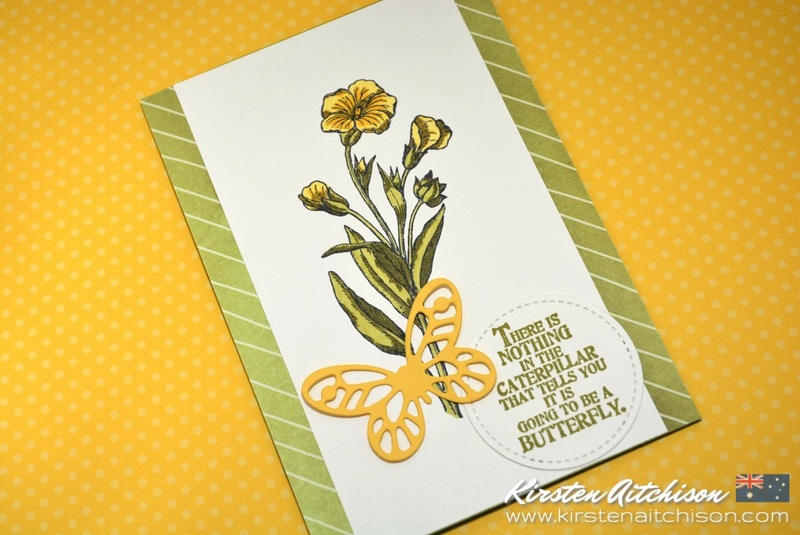 Beautiful card, Kirsten! You've celebrated a lovely stamp set a perfectly! What a great way to CASE Kirsten - love that you have taken it from Rachel's scrapbooking page. So clever and stunning too. TFS. Thanks so much Kylie :) I guess this goes to show you can get card inspiration from anywhere. 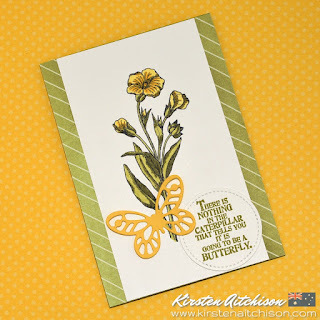 I love your card Kirsten, this set is one of my favourites and I haven't used it nearly enough, but I sense a revival coming on now that I am falling in love with my Stampin' Blends pens. So many of our sets that are of a line art nature can receive some TLC with these! Thanks so much Christine :) This is a wonderful set to pair with the Stampin' Blends, I really enjoy using my blends for colouring this image. Thanks for sharing and letting us CASE. This is a beautiful spring card. Thanks so much Sue :) I am definitely going to miss that flower. Great CASE! Love that everything is just in the right place, right proportion, right colour matching - you have such a good eye! So sweet! I love that you cased a portion of one of my pages. How fun is that? Thanks so much Rachel :) I love that inspiration can come from anywhere. Thanks also for being our special guest and for the inspiration.